Your art is so inspiring – so talented. I actually try to draw, and paint etc., but I just can’t. My husband can draw – and I’m in such awe at how he can / an artist can conceptualize and then create / recreate it. He’s been drawing for my posts of late and we’ve had fun doing so together. The colors in this painting are fantastic! Jodi, Nice post and nice painting. Makes me happy to know that you are making others happy. Beautiful piece! I love acrylic pours. They are so much fun! AND… So addicting! Congratulations on making someone happy with this beautiful and pleasing piece of art! Your definition of happiness agrees 100% with mine. Have a happy day, Jodi! Thanks so much Peter! You and Gertrude too!! True words and wonderful piece of art! Awesome happiness Jodi, I hope you will post a picture of the complete set when it is hung. I hope she will send me one 🙂 She lives out of state. Love the colors and love even more your post. SO TRUE! Making others happy is the happiest of happy’s for sure!! That is absolutely beautiful!! You are right about happy and I’m sure that will make her very very happy! aww 🙂 Thanks PJ! You’ve made me happy 🙂 LOL! Cool piece! I bet you had a blast creating it! You know it!!!!! 🙂 For sure! Thanks Patty! So fun to make!! The colours in this piece of artwork are absolutely stunning Jodi! What a beautiful gift. I love the colors and the marbled texture. Thanks Kerfe! I love painting with acrylic pour. So addicting! So creative! So freeing! WOWZA!! My eyeballs LOVE these colors together!! 💜🎨👍 I think the pouring thing is so cool!! 🙌 And I agree, giving a gift from your heART is always the best kind of true happiness! THAT is the most brilliant of happy comments. 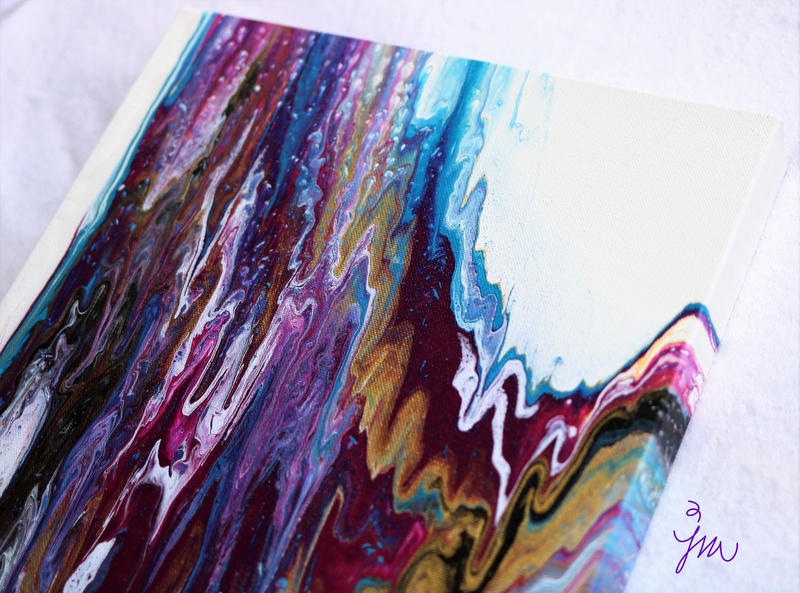 Love abstract painting, these colours are gorgeous, I imagine it’s a lovely piece. Love the pour technique, I must do one! Please share a photo of your art in her home! I have done a little one, how do you control the mess from the pour dripping off a large canvas? You’re so right, Jodi, making others happy is the happiest we can possibly be. And I have no doubt that your friend will love your wonderful painting and it will make you both very, very happy!